For today's TJ Blogstravaganza I've got a quick and inexpensive gift for your Holiday Gift Giving. I found these great round paperweights at my local Dollar Tree back in September - yep they only cost $1.00! I stamped my images in Black Archival ink on watercolor paper then colored them using the Marker Water Coloring Technique from a past TJNL edition. Cut them out with my Circle Nesites then popped them into the base of the paperweight. These paperweights are really great, as they have a screw off base to insert your artwork of photographs. 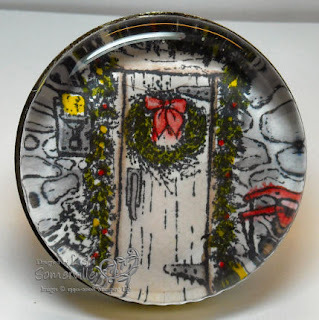 Be sure to stop by Pat's Blog today to see what she's created and view the links of the other Design Team members who are posting for the Blogstravaganza! Oh,Lisa, this is really cool! !